Amro Alkado previews the 3rd place play off match in Newcastle. 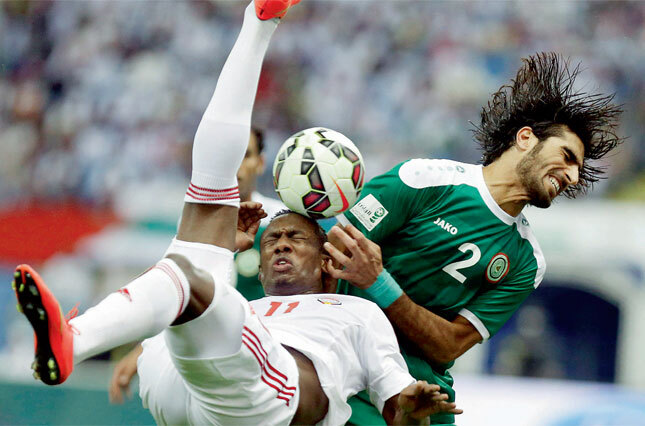 West Asian football has been on a steady decline for some time with the passing of the Saudi powerhouse and Iran incapable of breaking their Asian Cup hoodo in recent tournaments. The other two most impressive & successful West Asian Nations of late, will instead vie for the oft derided third place play off match. Iraq and the United Arab Emirates both failed to upset the odds in their respective semi finals, and will instead have a re-run of the Gulf Cup 2013 final, this time in the city of Newcastle on the Australian East coast. The two teams have clashed more recently since that final, but the last Gulf Cup tournament of 2014 was a pale imitation of the feisty 2013 edition, played against the backdrop of a tumultuous political period in Bahrain. That final was played by the two best West Asian Arab teams, but it wasn’t the pulsating action on the pitch that was the only thing to draw attention however. In a politically motivated decision, the Bahraini organisers denied entry to hundreds of Iraqi fans that had flown over from Iraq on specially chartered planes. Instead the ground was filled by a partisan Emirati crowd, who revelled in watching Omar Abdulrahman & Co. inflict a defeat on a strong Iraq side led by Hakim Shaker. The Iraqi fans and players felt hard done by and rightly so. They’d have loved a proper chance at revenge in the final against their West Asian counterparts, but the third place play off will have to do instead. Don’t bet on a mild mannered game, there is still plenty to play for. As we have highlighted before, Mahdi Ali’s UAE are a known constant. Since that game not much has changed within the squad, the manager is the same and the standout players remain the same. Omar Abdulrahman will be the thorn Iraq’s defence will have to watch out for, and his solo goal in that Gulf Cup final will still haunt Salam Shakir among others. Ali Mabkhout has also been in fine goal scoring with four so far, and he’s in pole position to win the golden boot if he scores again. Iraq on the other hand are a very different side from that of two years ago. A new coach in Radhi Shneishel, and several new faces replacing the old. Yaser Kasim will have been desperate to take to the pitch against South Korea, but his suspension meant he could only watch on helplessly as his teams mates succumbed to defeat. This is his final chance to shine on the continental stage for at least four more years, and if his previous performances are anything to go by, we should see him bossing the midfield once more. Younis Mahmous is likely in his last tournament for the Lions of Mesopotamia, and there is still no sign of a replacement for the Iraqi legend. He was fired up in the semi final, and will no doubt put in another performance full of passion for his team. Already an Asian great by all accounts, another goal would see him ascend to third highest ever Asian Cup goal scorer, alongside Japan’s Naohiro Takahara. Both teams can look back on this as a successful Asian Cup for differing reasons. Al Abyadh Al Emirati have targeted the latter stages of the Asian Cup and they have already achieved this, with the team peaking in the next few years, their next concern will be qualification for Russia 2018-and it would be silly to beat against them achieving that goal. The Lions of Mesopotamia came in with hugely subdued expectations, and have wildly surpassed them. It is important to put in clear terms that the country has a semi professional league which has been stop-start since June 2014 due to current events in the country. When seen in a holistic way the achievement of the Lions of Mesopotamia-who have been as consistent as any in West Asia over the last decade- is simply staggering. Radhi Shneishel has pledged his immediate future to his lender club Qatar SC, but he has left the door open for a potential return to the Iraq post after the season ends with unofficial talks confirmed by the coach imself. Whatever the outcome, Iraq have a hugely talented pool of players to choose from both local and from abroad and the FA must surely wake up to this realisation and quickly if this team is to improve and make the next World Cup.